There are many who are in the market for industrial steam vapor cleaners today, but they are not quite sure what they are looking for. They know they want something that is going to help clean their shop, office, or business. However, not being in the business of professional cleaning equipment, so they rely on brochures and sales reps to tell them what it is that they want and how this or that product is going to best suit their needs. There are a few basic things to keep in mind when shopping for industrial steam cleaners or industrial vapor cleaners. There are several features that you may want when it comes to an industrial steam cleaner. These include things such as a pressure gauge, so you know you are getting the right pressure and not entering any sort of danger zone. You also probably want to be sure you have a unit that has a low water indicator and a ready light. You do not want to start using the machine before it is ready and you don’t want to be in the middle of using it to find out the hard way that you’re out of the water required for the training. Controls need to be easy to understand and readily accessible. What Makes a High Quality Steam Cleaner? The most common steam cleaners on the market today are not made of the most durable materials. These machines are cheap to manufacture and are made of inexpensive materials. Namely, plastic. Plastic components on an industrial steam cleaner should be the first alarm bell that you need to keep looking. For light and home use, plastic components might be okay. But, there are two big problems when it comes to plastic components on a steam cleaner. First, plastic is fragile. Plastic can shatter or crack when it bumps into something or when the machine is handled too harshly. Plastic can begin to breakdown on its own over time. This means that parts are going to go bad and need replaced more frequently. And, what kind of trouble are you looking at when you need to have parts replaced on your steam cleaner? Do you have to ship it somewhere and have it shipped back? Is there a local facility you need to take the steam cleaner to and the pickup from once it has been repaired? And, how long do those repairs take? Are you paying for parts and labor or just parts or just labor? With plastic steam cleaner components, you very possibly will be responsible for both charges, because the warranty on these models isn’t as good as high quality industrial steam cleaners. The other problem with these plastic components on steam cleaners is that plastic cannot withstand the same heat as higher quality, metal steam cleaner components. These higher temperatures are imperative to the effectiveness of a steam vapor cleaner—it is what produces the steam vapor. Most residential and low quality so-called industrial steam cleaners may produce a little bit of steam, but the majority of their output is a mixture of warmed water and cleaning detergents. True vapor cleaners produce enough heat that they produce actual, pressurized steam. There is no need for harsh cleaning chemicals and no worries from how much water is being left behind and not sucked up by the machine, because there is no need to suction up steam vapor, which is going to evaporate within a few moments. 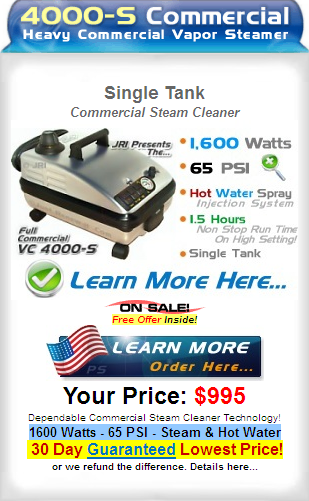 If you are looking to buy an industrial steam vapor cleaner, this is something very important that you cannot overlook. Yes, the initial investment is higher, but you are ending up with an overall lower cost of ownership and a device that actually does what you want it to do rather than one that will make more of a mess or spend its time collecting dust in the utility closet. 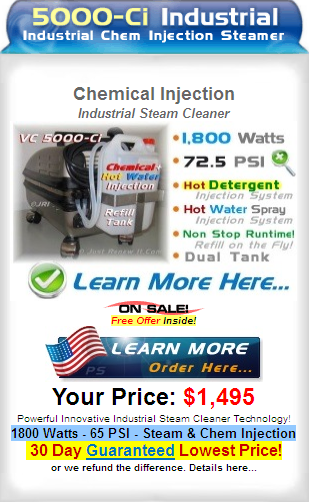 There are many variations of industrial and industrial steam vapor cleaners. For most jobs, there is no need for a continuous fill system. This is when you are working in relatively small areas at a time. However, if you are trying to complete a whole office or warehouse, the continuous fill units can be useful, because you are not having to stop, wait for a system to depressurize and cool down enough to be filled. You would instead have water constantly filling the unit during operation. So, this allows you to do larger areas at once. If you don’t need it, though, there is no need in investing in the more expensive machine. Instead, know when and how you plan on using your industrial vapor cleaner. There are several specifications to concern yourself with when pricing out industrial steam cleaners. Look at the actual cost of the unit. Be sure to see what attachments and accessories the machine comes with and what you will need to buy separately. While doing this, also review the warranty information. See what is covered and for how long. Furthermore, when there is a need for warranty service, look at what you will be facing then. 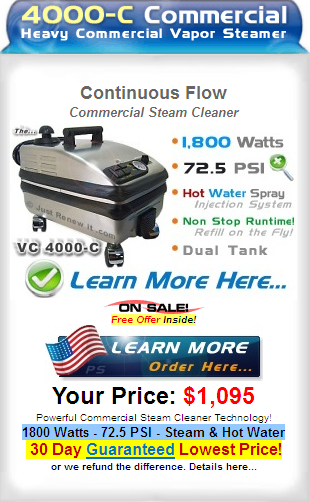 Do you ship the steam cleaner, is there a loaner or replacement while is being repaired, etc.? Nothing like having an expensive machine you need for your business that you cannot use. Another concern for many looking at industrial vapor cleaners is whether there are chemicals in the mix. Some industrial steam cleaners have reservoirs to mix in cleaning agents and the units can be used with or without these chemicals. The cleaning detergents are important, especially if you are working in a public business where people may be more sensitive or have allergies that are irritated by the chemical agents. This is one reason using vapor cleaners in industrial businesses has become preferable. The cleaning can be done without chemicals and minimal mess. There isn’t a bunch of water left behind so that areas must be left alone for hours to dry. These are not the sorts of traits you can expect from a residential steam cleaner. This is why it is so important to be sure that you are getting a unit that is more durable and more powerful when it comes to industrial steam vapor cleaners.